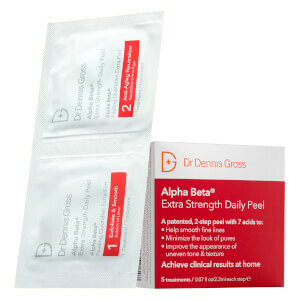 Original Alpha Beta Peel from Dr Dennis Gross is a facial peel developed to reduce the appearance of fine lines, wrinkles and dark spots and minimise the visibility of enlarged pores. Suitable for even the most sensitive skin types, the powerful, two-step treatment pads are pre-soaked for easy application. Its innovative formula combines Alpha Beta® Hydroxy Acids and antioxidants, including retinol, ubiquinone and resveratrol to exfoliate, nourish and rejuvenate skin, revealing a smoother, luminous and youthful-looking complexion. 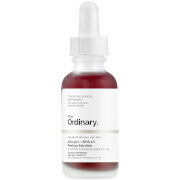 The resurfacing, anti-aging peel is enriched with soothing botanicals to relieve redness for long-lasting comfort. E.N. Includes 5 Packettes of Step 1 and Step 2 each. Follow the quick and easy two-step process, applying each pre-soaked towelette to your face, neck and décolleté using a circular motion. 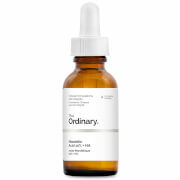 Alpha Beta Peels can be used every day (AM or PM), followed by your serum and moisturizer. Step One: Water, Alcohol Denat., Glycolic Acid, Hamamelis Virginiana (Witch Hazel) Leaf Extract, Potassium Hydroxide, Salicylic Acid, Polysorbate 20, Citric Acid, Lactic Acid, Malic Acid, Camellia Sinensis Leaf Extract, Achillea Millefolium Extract, Chamomilla Recutita (Matricaria) Flower Extract, Soy Isoflavones, Disodium EDTA, Copper PCA, Zinc PCA, Fragrance, Sodium Benzoate. Step Two: Water, Sodium Bicarbonate, Ascorbic Acid, Ascorbyl Palmitate, Retinyl Palmitate, Retinol, Tocopheryl Acetate, Resveratrol, Ubiquinone, Achillea Millefolium Extract, Camellia Sinensis Leaf Extract, Soy Isoflavones, Phospholipids, Copper PCA, Sodium PCA, Zinc PCA, Simethicone, Octoxynol-9, Tetrasodium EDTA, Sodium Benzoate, Phenoxyethanol. I used peeling product for 3 years. This is first time I try DR Dennis's Gross's product. Really love it and feel like I have a new face in the next morning.